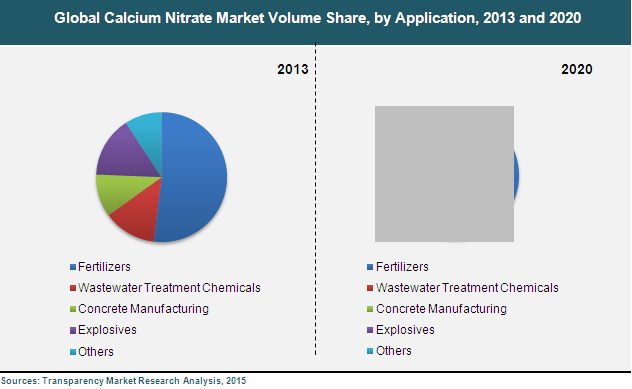 Presence of several small and medium sized regional companies makes the global calcium nitrate market somewhat concentrated. A few large companies have a stronghold over the market. Despite it, competition among them is stiff. The companies are seen expanding their production capacities and also setting up new business units, particularly in emerging nations of Asia Pacific where land and labor are cheap. Another noticeable trend in the global calcium nitrate market is the thrust on mergers and acquisitions and diversification of product portfolios by key players. They are also seen banking upon product differentiation and focusing on better production methods of nitrate compounds. Some of the companies with substantial presence in the global calcium nitrate market are Agrium, Inc., Vardhaman Fertilizers and Seeds Pvt. Ltd., Yara International ASA, Airedale Chemical, Rural Liquid Fertilisers (RLF), GFS Chemicals, Inc., and Haifa Chemicals Ltd. Going forward, the global calcium nitrate market is predicted to rise at a steady 4.8% CAGR over the course of the forecast period between 2014 and 2020. This has been stated by Transparency Market Research in one of its reports. At this pace, it predicts the market to become worth US$10.18 bn by 2020. Some of the application segments of the global calcium nitrate market are explosives, waste water treatment chemicals, concrete manufacturing, and fertilizers. Currently, the segment of fertilizers generates most of the demand in the global calcium nitrate market. This is because calcium is much needed for development of plant tissues. Further, calcium nitrate fertilizers do not acidify the soil. They also do not have heavy metals and chlorides. Besides, they remain unaffected by temperature. From a geographical perspective, the global calcium nitrite market is being led by Asia Pacific. This is because of the massive tracts of land devoted to cultivation of food crops in nations of China and India. The TMR report finds that the global calcium nitrate is being majorly boosted by the demand for oilseeds such as soybeans, wheat, and corn. The market growth is also being propped up by the soaring demand for wastewater treatment. As urbanization and industrialization happens at a rapid pace, wastewater treatment has also been on the rise. In fact, the emerging economies are at the forefront of driving demand in the calcium nitrate market because of the massive industrialization and urbanization in the regions. One drawback of calcium nitrate, on the other hand, is its hygroscopic in nature. It is considered as hazard class 5.1 by regulatory regimes. This is affecting the growth in the global calcium nitrate market to an extent.